the advance of a freezing front upwards from the permafrost table during annual freezing of the active layer. a mountain glacier whose flow is confined by valley walls. instrument used to measure wind direction; also called wind vane. the pressure exerted by water vapor molecules in a given volume of air. a comprehensive term for ice of any origin occupying cracks in permafrost. pack ice in which the floes are tightly packed but not frozen together, with very little, if any, sea water visible; ice cover practically 10/10th. pack ice composed of loose, widely spaced floes; ice cover 1/10th to 3/10th. precipitation that evaporates before reaching the ground. a measure of a fluids resistance to flow; can be thought of as a measure of fluid friction. the greatest distance that prominent objects can be seen and identified by unaided, normal eyes. Tools that provide visual images of data on-the-fly. the ratio of the volume of the water and ice in a sample to the volume of the whole sample, expressed as a fraction (or, less commonly, as a percentage). the amount of heat required to raise the temperature of a unit volume of a substance by one degree. the amount of heat required to melt all the ice (or freeze all the pore water) in a unit volume of soil or rock. the forward edge of an advancing warm air mass that is displacing cooler air in its path. at a given level in the atmosphere, any low that is generally characterized by warmer air near its center than around its periphery; the opposite of a cold low. the dark appearance of the underside of a cloud layer when it is over a surface of open water; it is darker than land sky, and much darker than ice blink or snow blink. water substance in vapor (gaseous) form; one of the most important of all constituents of the atmosphere. a water-filled depression surrounding a palsa. snow with red algae growing on it. ogives that show some vertical relief on a glacier; usually the dark bands are in the hollows and the light bands are in the ridges; form at the base of steep, narrow ice falls. the state of the atmosphere, mainly with respect to its effects upon life and human activities; distinguished from climate by focusing on short-term (minutes to about 15 days) variations of the atmosphere state. glacier ice that has been exposed to sun or warm wind so that the boundaries between ice crystals are partly disintegrated. the processes of ablation and accumulation which gradually eliminate irregularities in an ice surface. ice occurring in an ice wedge. 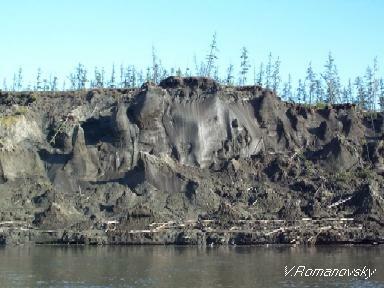 ice-bearing permafrost in which all the soil particles are held together by ice. the dominant west-to-east motion of the atmosphere, centered over the middle latitudes (35 to 65 degrees latitude) of both hemispheres. a condition in which daylight is diffused by multiple reflections between a snow surface and an overcast sky; contrasts vanish, and the observer is unable to distinguish the horizon or any snow surface feature. created by the World Meteorological Convention and recognized as a special agency of the United Nations in 1951; the WMO consists of more than 185 member countries; and facilitates international cooperation in all aspects of meteorology. any scientific project (field experiment, inter-comparison, etc.) internationally performed under the aegis of the World Meteorological Organization. the world-wide, coordinated system of meteorological facilities and services provided by World Meteorological Organization members for the purpose of ensuring that all members obtain the meteorological information required both for operational work and for research; the essential elements of the WWW are: the global observing system, the global data-processing system, and the global telecommunication system. A type of Pleistocene-age (formed 1.8 million to 10,000 years before present) permafrost that contains a significant amount of organic material with ice content of 50 to 90 percent by volume. Thawing yedoma is a significant source of atmospheric methane. a general category of ice that represents the transition between nilas and first-year ice; usually 10 to 30 centimeters (4 to 12 inches) thick. the ratio of increase in stress acting on a test specimen, to the resulting increase in strain, under constant transverse stress. the persistence of a nearly constant temperature, very close to the freezing point, during annual freezing (and occasionally during thawing) of the active layer. that portion of the subsurface where the conditions of temperature and pressure are suitable for the formation and preservation of gas hydrates.